The Apex Center for Entrepreneurs inspires and empowers students, faculty and alumni to turn their passion, purpose, and ideas into action. 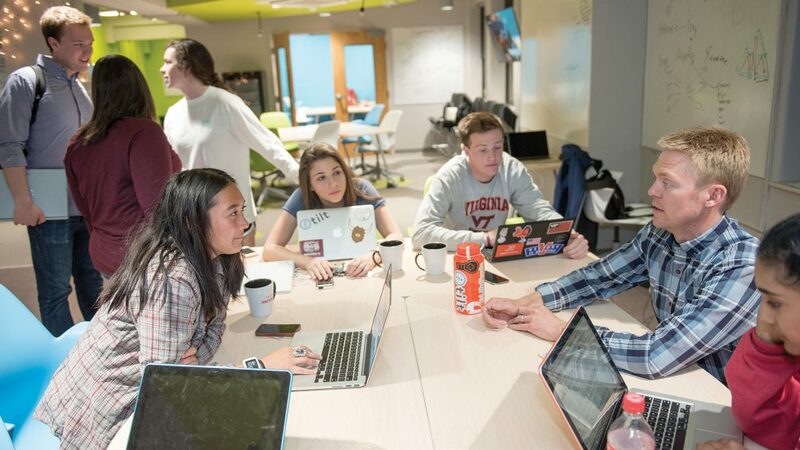 Our portfolio of programs is inter-disciplinary, and provides any Hokie, from any major, and any year the opportunity to engage in all phases of the entrepreneurship and innovation process, and encourages alumni to interface with the next generations of entrepreneurs. The Apex Systems Center for Innovation and Entrepreneurship is named in recognition of a joint commitment of $5 million by four Virginia Tech alumni, Brian Callaghan, Ted Hanson, Win Sheridan, and Jeffrey Veatch. Our namesake, Apex Systems, is the information technology staffing and services company that Callaghan, Sheridan, and Veatch founded in 1995, which Hanson joined as chief financial officer in 1998. Apex Systems, which was acquired by ASGN Incorporated in 2012, has trailing 12-month revenue of more than $1 billion. In 2013, it placed more than 20,000 professionals while serving more than 1,200 clients across a variety of industries.